The inaugural GlowRun has partnered with Zappos.com to reward those suited in extravagant costumes and glowing garments with spectacular prizes courtesy of the online retailer. Participants’ creativity with luminous duds is an essential component in transforming the race route and AfterGlow block party into a one-of-a-kind radiant experience in Downtown Las Vegas. Runners and walkers will have the opportunity to participate in the costume contest on an individual and team level. At AfterGlow, those clad in unique and glowing gear will look for the Poggled representatives who will be photographing costumes. Images will then be uploaded to the GlowRun section on Poggled.com which allows everyone to view the glow in all its glory. Judges will make their final decisions that night. Prizes will include an assortment of Zappos.com gift cards ranging in value. 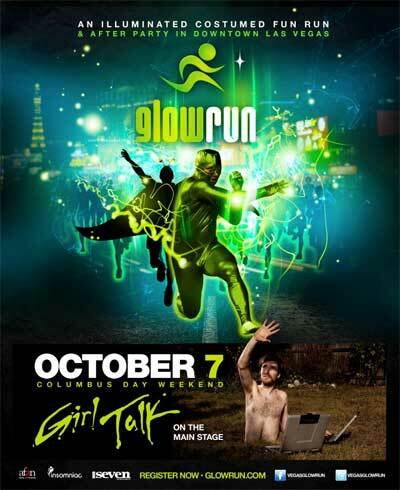 The inaugural GlowRun is produced in partnership with Insomniac and Seven Magazine. It will be held October 7 in the Fremont East Entertainment District. Registration is $60 per runner and an additional $5 for walk-up participants, while groups of six or more can receive a $5 discount. Pre-registration can be completed by visiting www.glowrun.com.